In last week’s post I mentioned that one of the things I miss most about being away from the UK is a good pint of bitter. Fortunately, Brazilian microbreweries are starting to produce them, with last week’s Beer of the Week (Baden Baden 1999) being one of the better examples. Another interesting – surprising even – development in Brazilian beer tastes is the emergence of IPA (Indian Pale Ale) style beers. Surprising because their strongly hoppy, bitter and high alcohol content run contrary to all the mass produced beers that dominate the Brazilian market – namely bland ‘Pilsners’ like as Brahma, Skol and Itaipava. IPAs are said to originate from the time of the British Empire, when it is claimed that brewers in the UK produced beers with more hops and a higher alcohol content to ensure traditional Pale Ales lasted the boat journey from the UK to India (hence the name). However, there are those who challenge this as being urban myth so your guess is as good as mine. Nevertheless, all you need to know is that traditional IPAs are not for the faint-hearted. Apparently, they also put hairs on your chest. Where purchased: Bourbon Shopping (Barra Funda, SP). 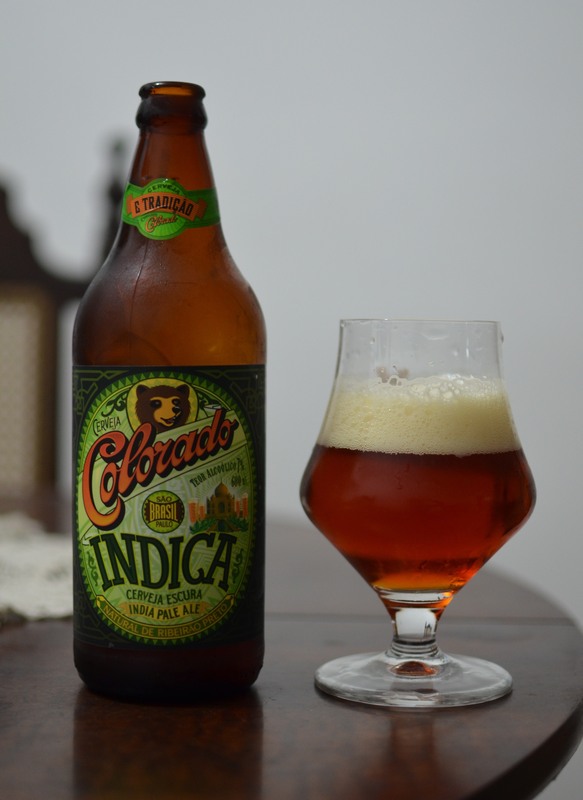 Background: Founded in 1995, one of the things I like about Cervejeria Colorado is that it is one of growing number of Brazilian microbreweries who are willing to stick their necks out and break free from the traditions of beer making. What I mean by this is that many microbreweries in Brazil are heavily inspired by beers of Lowland Europe – which given the large German heritage in the south of Brazil isn’t that much of a surprise. So, whilst many Brazilian microbrews only tend to brew European imitation beers, often proudly noting that they are brewed according to the German law of purity (not that one), microbreweries like Colorado are brewing beers that whilst influenced by those from Europe are also adding their own Brazilian touch. Cervejeria Colorado are, as they say on their website, “not afraid to be Brazilian”. For example, Colorado’s beers mix traditional malt and hops with Brazilian coffee, molasses, cassava, honey and Brazil nuts, whilst tapping into fresh water of the Guarani aquifer. All in all, microbreweries like Colorado are exactly what I was looking for when I started ‘researching’ Brazilian beers. Firstly, after Original, Cevejeria Colorado’s beers have some of my favourite beer labels in Brazil, and so whilst they say you should never judge a beer by its label (Ed. Er, are you sure about this? ), Colorado’s labels certainly jump out at you when you’re scouring the shelves in the supermarket. Each of Colorado’s beers has a customised label designed by the American beer expert / beer label designer Randy Mosher, and Indica’s has Fan image of the Taj Mahal – its pillars charmingly replaced with beer glasses. Colorado’s IPA is based upon the traditional recipes of IPAs from the UK, although it mixes English hops with Brazilian brown sugars. Well, it pours a caramel colour and, as you can see from the photo, it has a lively white head. Its relatively high alcohol content (7%) is definitely noticeable and you’ll certainly feel it once you’ve drunk a few! Taste-wise it is hoppy, bitter and pretty crisp – as you’d hope from a good IPA. There’s also a citrus / grassy touch which gives it a nice refreshing kick. Overall, a pretty decent IPA. the book is on the table’s Verdict: Of all the beers that I’ve so far discovered in Brazil, Indica is one of the few that I go back to when I’m pondering my options in the supermarket – which, I guess, says it all. One of my favourite Brazilian beers, but definitely one for the hopheads. Great beer, amazing labels indeed. We actually did a feature at Time Out SP on Mosher and his craft beer labels, and included Indica as one of his best in the gallery, check it out http://www.timeout.com.br/sao-paulo/en/bars/features/399/the-art-of-the-craft-beer-bottle#picture0. That aside, when are we hitting a cervejaria? Long overdue. Keep the beers coming! Thanks Juan. I saw that article and linked it in the text – very helpful! Yeah, we should arrange that Cervejeria Nacional trip sometime. Love that place! My only comment would be that personally I don’t think that Baden Baden and Eisenbahn can still be considered microbrews. They might have that style/quality and certainly were at one point but I think that changed when Brasil Kirin bought them both. Yes, I think that’s a fair point. They certainly now have an advantage over other ‘genuine’ microbreweries. However, the fact they’re doing something a bit different is good enough for me!